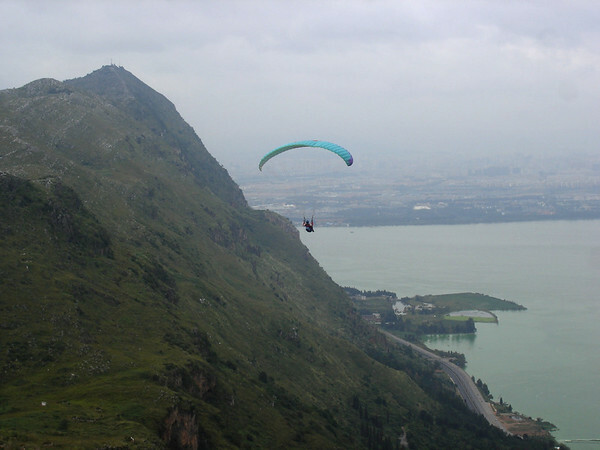 Towering above Dianchi Lake to Kunming's southwest, Xishan (西山) is the city's most recognizable landmark. Old Buddhist and Daoist temples, wooded mountain paths and breathtaking vistas make Xishan one of Kunming's most popular daytrips. We took advantage of the recent beautiful weather for a hike to the top. 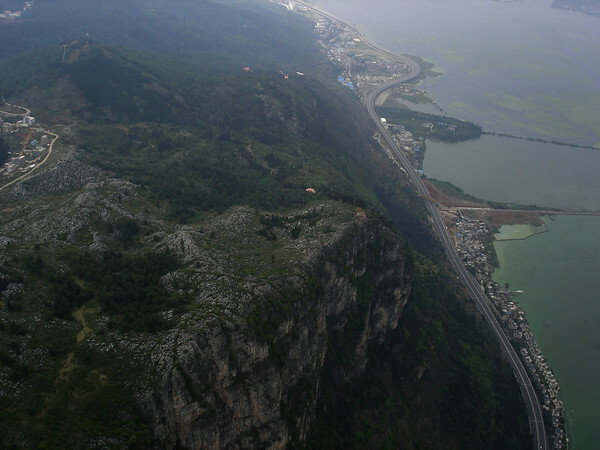 Literally meaning 'Western Mountains', Xishan is composed of five small mountains: Biji Mountain (碧鸡山), Binao Mountain (碧蛲山), Huating Mountain (华亭山), Taihua Mountain (太华山) and Luohan Mountain (罗汉山). Luohan Mountain is the tallest of the bunch, rising more than 600 meters above the lake to a maximum elevation of just over 2,500 meters. The road from the bottom of Xishan up to the top is more than six kilometers. The lower portion of the mountain is free to enter and is most notable for Huating Temple and Taihua Temple, which both cost six yuan to enter. 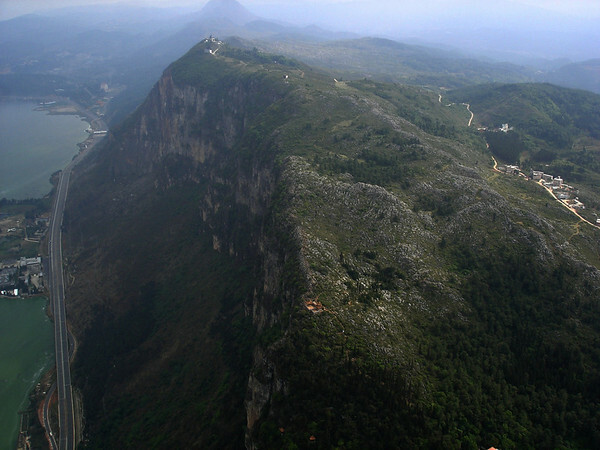 The scenic upper portion of the mountain is home to the Daoist temples and grottoes of Sanqingge (三清阁) as well as Xishan's most famous scenic point, Longmen (龙门), the 'Dragon Gate'. Entry to this part of the mountain is 40 yuan per person. There are several ways to ascend Xishan. Hiking is the slowest and best way to appreciate the temples, views and generally tranquil atmosphere of the area. The hike to the top can be done in around two hours at top speed or five or six hours if one wants to fully explore the temple compounds and take in the constantly improving views of the city and Dianchi Lake below. Cycling is also an option, although bicycles cannot enter the scenic area at the top. Visitors who don't have the time or energy to get up Xishan on their own can take shuttle buses. Shuttle buses are 15 yuan per person one way, and stop at Huating Temple and Taihua Temple on the way up to drop off or pick up passengers. Bus services run from 8:30am to 5:30pm. Lastly, there are two sets of cable cars that can be taken up or down parts of Xishan. The lower cable car starts just outside the west entrance of Haigeng Park on Hubin Lu (湖滨路) and ascends to slightly below the upper area of Xishan. The other cable car heads from the entrance of the paid scenic area to Xishan's upper reaches, a short walk from Longmen. The bottom cable cars run from 8:40am to 5pm and are 40 yuan one way or 70 yuan both ways. The upper cable cars run from 8:30am to 5pm and cost 25 yuan one way or 40 yuan roundtrip. After a big breakfast and a taxi ride across town, we started walking up Xishan at 11 o'clock, leaving the bus-filled parking lot behind. The road was free of traffic except for the occasional tour bus. The sounds of the city faded away as we walked, replaced by birdsong and the rustling leaves. Small pavilions began to appear in clearings, offering some of the first glimpses of Kunming across the northwest portion of the lake. After 20 minutes of strolling, we came to a somewhat unexpected monument to Chinese mechanics who labored for the Chinese cause in Southeast Asia during the Second World War. Another short walk and we had arrived at Huating Temple, a Chan/Zen Buddhist temple originally built in 1314. The complex has been destroyed and rebuilt several times in its 700-year history. Huating Temple's last major restoration began in 1923 and was overseen by the monk Xu Yun (虚云), who it is claimed lived to the ripe old age of 119. At present a memorial hall for Xu Yun is being constructed opposite the temple and is expected to open later this year. We entered Huating Temple and discovered a covered walkway in a flowering plant-filled garden on our left and a pond filled with goldfish and turtles in front of the temple's front hall on our right. Directly before us was a row of stupas, each containing the ashes of a different deceased monk. A living monk walked laps around the pond while several turtles sunned themselves. One's eyes and nose cannot help but notice the profusion of flowering plants in Huating Temple. Camellias, cherry trees, magnolias and plum trees are all currently in bloom. The courtyard between the two main worship halls is filled with old trees dating back to the Qing Dynasty, including gingkos and camellias and a 300-year-old plum tree that give the (somewhat) recently renovated temple a living link to its past. Inside Huating Temple's main hall is a large golden statue of Sakyamuni Buddha flanked by two slightly smaller Buddha statues. The hall is a clutter of brightly colored flower arrangements, brocade tapestries and intricately carved lamps. The center of the hall was lit by sunshine streaming through windows concealed in the rafters. In stark contrast to the brightness of the hall's center were the shadowed side walls of the hall. The walls are seas of statues – 500 in all – of arhats, Buddhists who had attained nirvana and were believed to not be reborn into any world after physical death. Inspired by the arhat statues of Bamboo Temple, the face of each of Huating Temple's arhats has a unique expression, some humorous or cartoonish, others grotesque or lifelike to eerie effect. Just like Bamboo Temple, Huating Temple does not allow photos of its arhat statues. We had only walked a couple of kilometers but were getting hungry again when we happened upon a new and very clean restaurant on the temple compound's south side. Like most temple restaurants in China, it did not offer meat, but somewhat unusually it did offer dishes containing eggs and the local cheese rubing (乳饼). We had a tasty dish of rubing, broccoli and tomato and hit the road. Just past Huating Temple and branching off the blacktop road is Taihua Ancient Passage (太华古道), a stone path winding through the woods that is half a kilometer shorter than the paved road. After a kilometer and a half we reached Taihua Temple (太华寺). Some of Taihua Temple's buildings are tumbledown, with holes in the floors and grass growing out of the tiled roofs. The temple is not falling to pieces, but it feels and looks older than its neighbor down the road. Parts of the temple compound that are a bit run down have a charming, rustic quality but the main hall is immaculate and bright with a fresh coat of paint. A large pavilion that abuts the mountainside behind the temple is currently under construction and off limits to visitors. Next to a pond lined with benches is a spacious and grassy seating area with stone tables overlooking Dianchi Lake and Kunming. This veranda offers the first truly panoramic views of the city. The grounds of Taihua Temple are much larger than those of Huating Temple. There are many places to sit and enjoy the quiet or admire the beauty of the flowering trees and manicured grounds – which we did. After leaving the temple compound, we reconnected with the main road and quickly reached a memorial park featuring the grave of Nie Er (聂耳), the Kunming native who in 1935 composed the music for The March of the Volunteers (义勇军进行曲), which was named China's national anthem in 1949. Across from Nie Er's grave is a visitor center with hotels, restaurants, street food and a police station. It is also where the free portion of Xishan ends and visitors pay for tickets or a lift on the upper cable car. The kilometer or so of flat contour road that precedes the steep steps to Sanqingge and Longmen can be ridden on a tram for eight yuan per person. From here the climb upward becomes much steeper, with stone staircases heading upward in several directions. Multilingual signs show the way to the pavilions and grottoes of Sanqingge as well as Longmen. The path we took led to a 72-step staircase with a small grotto at the top. 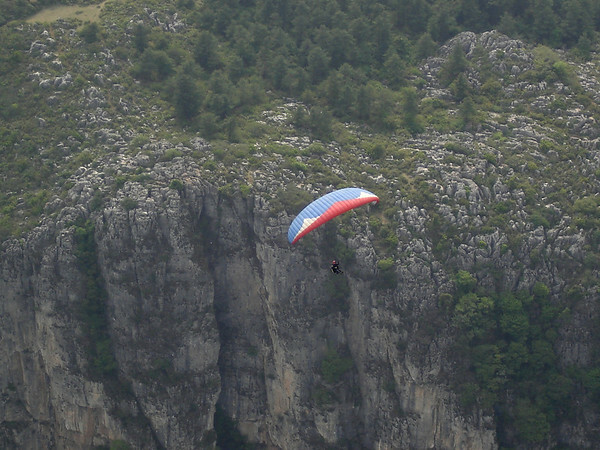 After some climbing and descending it jutted out alongside onto a cliff face hundreds of meters above the lake. A tunnel from the viewing platform led down through solid rock to Longmen. The stairs are hewn out of rock and the feet of innumerable tourists have worn them smooth and slippery. We joined a dozen or so people on Longmen's small platform. The gate itself is rather tiny, as is its accompanying pathway. Daoist grottoes built into the mountainside flank both sides of the gate. The pathway is hand-carved and barely wide enough for two people traveling in opposite directions to pass. Legend has it that it took 72 years for monks to cut this path into the mountain. Most visitors to Longmen have their photo taken while rubbing a small round part of the gate's archway. After snapping a few photos and passing through the gate we followed the path downwards. We headed past the cable car station, turned left and walked a few hundred meters uphill to the top of Luohan Mountain. We reached the final stop of our journey, Lingxu Pavilion (淩虚阁), where several people stood or sat around chatting, snacking or simply enjoying what many consider the best view of Kunming. We spent half an hour at Lingxu Pavilion, during which time we rehydrated, had a snack and wondered why we hadn't hiked up Xishan sooner. Xishan can be reached by taxi from downtown Kunming for around 40 to 50 yuan. Alternately, visitors can take the number 6 bus to the Gaoyao bus stop (高峣站). I remember going to Dragon's Gate after being told by a student that it was 200m tall. I was disappointed to find it was at a height of 200m - and rather smaller than I'd imagined! Some photos of Xi Shan from the air. Damn cool. Shame about that road though. Great walk, thanks for the post. Did you have to buy tickets to enter the different temples? If so, how much did it cost? does anybody know something about the "miniature stone forest" that can be reached from the walkways among the daoist temples? It is worth visiting? the "miniature stone forest" is quite a joke, as they're just rocks... albeit the rocks are the same kind as the stone forest ones, but there's really nothing special about them. if you're there already for a nice walk on xishan, you can check them out, but definitely not worth a special trip. Just have to pay for Dragon's gate.another places are free. Went there last week. Did not see what happened at ticket office, but if you get the chair lift (I enjoy the ride) they make you buy tickets for Long Men (Dragon Gate) as well. Even if you don't want to go to Long Men. Linked from Best of Kunming Awards 2018, this post is in need of an update. The convenience of KRT XiShan Park Station at end of Line 3 with the blossoming of traditional Yunnan eateries along the mouth of the entrance. What is a non-traditional Yunnan eatery? Why are these 'traditional'?